The activity of the comet 67P/Churyumov-Gerasimenko increased during its approach to the Sun and lately it’s emitting about 300 kg (a bit more than 660 lbs) of water vapor per second. It’s about a thousand times the activity recorded a year ago, when the Rosetta space probe reached the comet. In essence, today’s emission is the equivalent of about two bathtubs per second while a year ago it was equivalent to two small glasses per second. The observation of this activity with all the exams that will follow of the data collected is one of the goals of the Rosetta mission. However, in recent days ESA engineers had to move the space probe farther to avoid having the jets of gas and dust preventing its instruments to see the stars making it lose its orientation. Next month there will be a summer weather on the surface of the comet 67P/Churyumov-Gerasimenko. When Rosetta space probe reached it, the temperatures recorded on its surface were around -70° Celsius (-94° Fahrenheit), which have risen with its approach to the Sun. In the next few weeks peaks of a few tens of degrees Celsius above zero are expected. 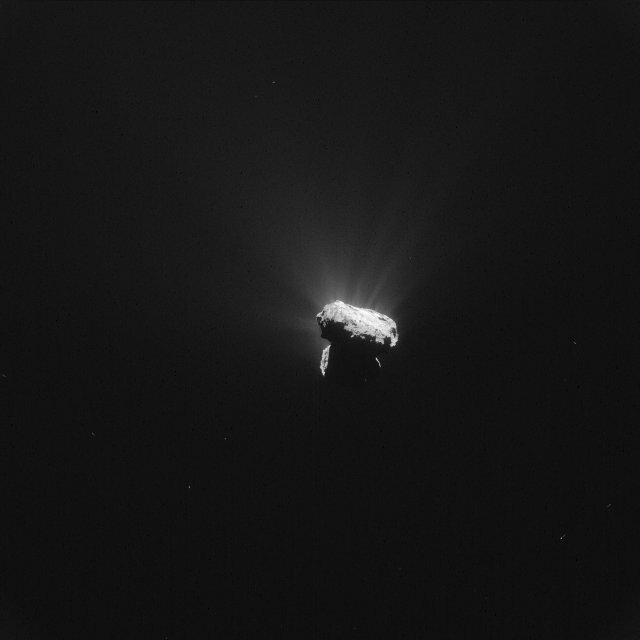 Despite its distance, the Rosetta is space probe too close to the comet 67P/Churyumov-Gerasimenko to observe its tail. Astronomers on Earth have been taking care of that using ground-based telescopes. Recently, its extension has exceeded 120,000 km (about 74,500 miles). All the data will be put together to better understand the processes that occur in comets. Something like that was also done by a fan, Mattias Malmer, who used images released by ESA to build a 3D model of the comet 67P/Churyumov-Gerasimenko. Eventually, ESA put online a visualization tool based on that work. At ESA they keep on hoping to be able to re-establish contact with the lander Philae but the activity on the surface of the comet 67P/Churyumov-Gerasimenko might have moved it. Worst-case scenario, the Rosetta space probe will keep on examining on its own the comet while it’s moving away from the Sun for another year. The perihelion passage was a spectacular and scientifically important moment but researchers want to understand even better the next step with the decline in activity on its surface.